We spent three nights at this hotel in January 2014 and really had a great experience. 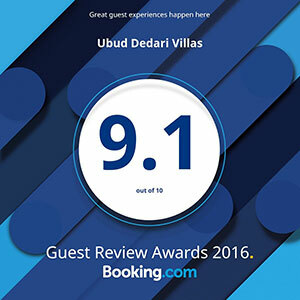 It is located just a short drive from Ubud. The rooms were well decorated, clean, and met all of our needs (including wireless internet and an in-room safe). The hotel has a great pool with a great view to the forest. The terrace was the best place because we can feel the forest atmosphere and enjoy the sound of the nature after a long day exploring Ubud. The staff at this hotel was absolutely amazing! We ate breakfast on-site every morning from the hotel during our stay and the staff was extremely accommodating, friendly, and polite every time. I would definitely stay here again and highly recommend this hotel to anyone staying in Ubud. The setting in the middle of the jungle is unbelievable , the infinity pool having a view to die for!. The staff were very helpful and friendly throughout our stay, and you get breakfast served to you on your veranda at a time of your choosing which is a lovely touch. And the veranda! Wow! My husband and I stayed at Ubud Dedari for the first half of our trip to Bali in May 2013. We absolutely LOVED staying here, and of the five hotels we stayed at on our vacation, it was definitely one of the best!